When your loved ones are in their late golden years, trips to the hospital or clinic may be all-too-common. They will be requiring procedures and medical assistance which are vital to maintaining their health. The trip itself to the clinic, hospital, or medical facility, though, can already cause stress to the patient. A great way to prevent this would be to bring the needed care to your senior loved ones in the comforts of their own home. This will also make for much better care since services will be specialized and personalized according to the needs and even preferences of the patient. 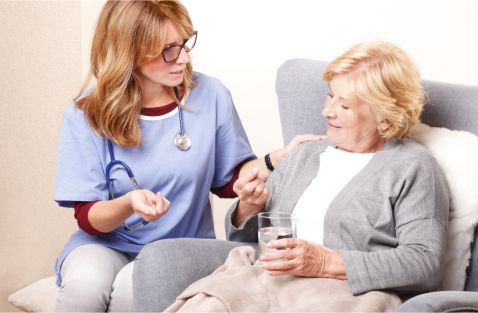 When a patient is in need of particular care and treatment, especially due to old age, this kind of care can only be provided by skilled nurses. Skilled nurses are basically practical nurses who are licensed to carry on duties and responsibilities needed to care and tend to particular medical needs of a patient. If you are seeking the services of skilled nursing in Denver, Colorado, then trust Home Health Preferred, LLC. We comprise of a team dedicated and well-trained health care professionals which include caregivers—specially trained in providing home health care and assistance such as personal care and homemaking services—and skilled nurses. Our skilled nurses are licensed by the state, have undergone extensive training, and are well-equipped to be able to provide your elderly loved ones the medical services they need. From therapies like anti-coagulation therapy and infusion therapy to different kinds of personal and medical care, like diabetic, ostomy, post-surgery, wound, and urinary catheter care, our skilled nurses are sure to give the proper, safe, and efficient care. At Home Health Preferred, LLC, we see to it that our health care professionals and caregivers are not only trained in providing the services they specialize in but to make sure that these services are given with genuine care and compassion. This makes for a holistic and pleasant experience for your elderly loved ones, as we continuously find ways to make them feel better and comfortable. The biggest advantage of in-home care is its ability to be specialized and customized according to the unique needs and lifestyle of each client. We, therefore, use this advantage as our asset: providing various personalized services that even includes 24 hour care. With us, your elderly loved ones will no longer have to take those long, stressful trips to the clinic, hospital, or medical facility. Our skilled nurses and caregivers are dedicated to giving the quality and efficient long term care in Denver, Colorado that your senior loved one’s needs and deserves. Talk to us today at 720-370-6772 and know more about how having our skilled nurses at the comfort of your elderly loved ones’ home can truly make things easier, better, and much more efficient and comfortable. You may also inquire about our other services such as personal care and homemaking services, which are provided by our equally skilled caregivers. This entry was posted in Skilled Nursing Services and tagged health care professionals, homemaking services, In-Home Care, skilled nurses. Bookmark the permalink.